I prefer roof systems myself. 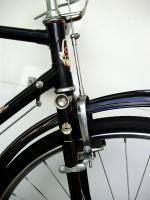 I have had yakima with round bars for the base and it was very wind noisy. I now use Inno rack system with rectangle bar base rack and it has little to no wind noise, you do not even know its there. I also do not use the wind block baffle on the front. I use two fork mount racks and a frame clamp mount in the middle for three bikes. How many bikes do you want to carry? If you prize the paint on your bikes get this style. the one you linked to beat the crapola out of your paint job.